Knight’s suppressed sniper revolver rifle was developed by American company Knight’s Armament Co on the order from unspecified American government agency, engaged in various clandestine operations. Said agency required a suppressed (silenced) sniper rifle which would not leave any unnecessary evidence such as fired cases. How many such rifles were made and how they were used is not known. Knight’s suppressed revolver rifle is based on the frame of the Ruger Redhawk .44 Magnum revolver. It is fitted with new .30 caliber (7.62mm) barrel with integral suppressor, and a new 6-shot cylinder. Barrel-to-cylinder gap is tightened to about 0.005 of an inch. Standard double action trigger with external hammer is retained. Gun was equipped with detachable shoulder stock, removable bipod and a scope mount. 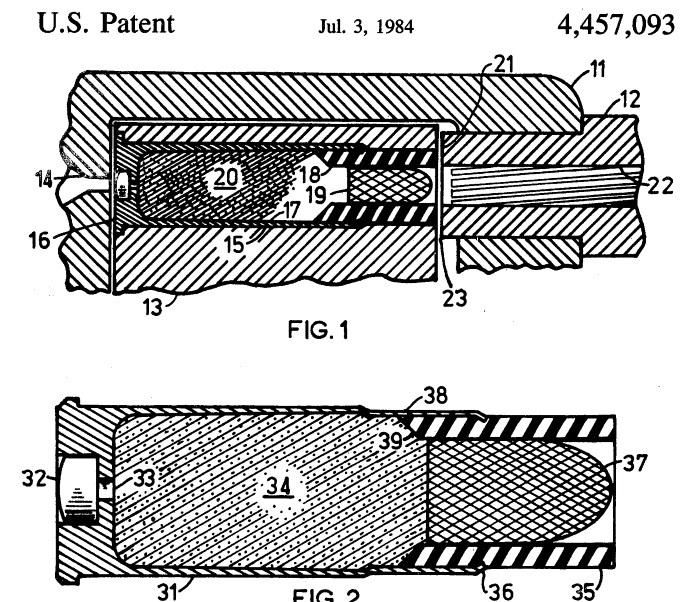 To achieve effective gas seal between cylinder and barrel, Knight’s engineers used a proprietary ammunition, based on patents of the Charles Olsen. According to his patent, parent case (.44 Magnum in this case) is fitted with aluminum insert at the front, which, in turn, houses a sub-caliber (0.3” / 7.62mm) pointed projectile, made from solid brass. Upon firing, powder cases firmly press the front of the insert against the breech end of the barrel, creating a temporary gas seal. 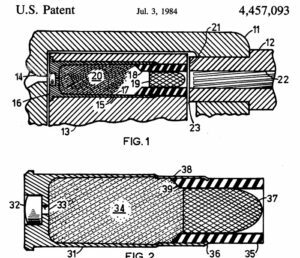 It is interesting to note that original intent of this design, as stated in the patent documentation, was to increase bullet velocity due to more efficient use of powder charge (no gas escape via the barrel – cylinder gap). Olson even developed some of these “high velocity” rounds based on .38 Spl cases, but for the Knight’s suppressed revolver muzzle velocity was, for obvious reasons, limited to just below the speed of sound. As a result, this gun is reported to have sound signature of about 119 dB, with effective range of up to 100 meters.